What's Behind This Weekend's Box Office Slump? First Lady: [about the re-election] You're wondering, what was the point of it all? Why you? Why now? Why did the Lord pick you out of all people? What are your special qualifications? And did the Lord even pick you, or was it just having really, really powerful friends? Greetings again from the darkness. Showing flashes of brilliance, writer/director/producer Paul Weitz is putting together a very nice career. He pulls most of his lead actors from his previous projects. Dennis Quaid ("In Good Company"), Hugh Grant ("About a Boy") Chris Klein ("American Pie") all have Weitz ties and Mandy Moore, Jennifer Coolidge and the great Marcia Gay Harden all easily slide right in. Quality comedy is usually the most elusive film genre for writers and directors and satire is the absolute most challenging form of comedy. Poking fun at our government, politicians, TV shows and overall way of life has to be handled delicately in order for the audience to openly laugh at ourselves. With a few exceptions, "Dreamz" just misses out on the laughs it shoots for. 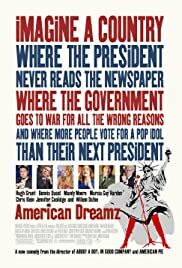 Quaid's over the top portrayal of Bush, Dafoe's bumbling Cheney and Mandy Moore's shot at Brittany Spears will all cause a few smiles, but only a couple of chuckles. 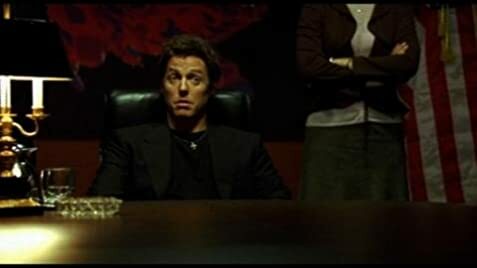 Surprisingly the best performance comes from Hugh Grant as the disillusioned host of the wildly popular TV show "American Idol" ... oh sorry, "American Dreamz". Watching Grant struggle with his lost interest is actually the best part of the show. Hopefully, the trailer will not give away the two or three scenes that make this one palatable. Though I really did not enjoy most of the film, I will say that it has not dampened my hope and trust in Paul Weitz one bit. Creative filmmakers will stumble periodically. The great ones just go at it again and again.